From aardvarks to yaks, fearsome creatures to festive outfits, zoos to backyards, distant memories from childhood, and fresh calamities from last week. Each author interprets the word animal in his or her own way. 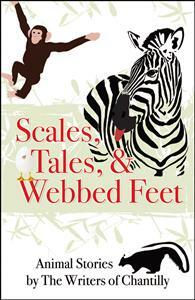 SCALES, TALES AND WEBBED FEET is an eclectic collection of stories with the central theme of animals. From aardvarks to yaks, from fearsome creatures to festive outfits, from zoos to backyards to distant memories from childhood, each author interprets the word animal in his or her own way. There is wry humor, deep appreciation for their companionship, emotions at a loss, and some scary moments to be sure. We would like to welcome you to our book. We promise you a wonderful read and are sure you will find stories that you remember lovingly from childhood – or, just last week.